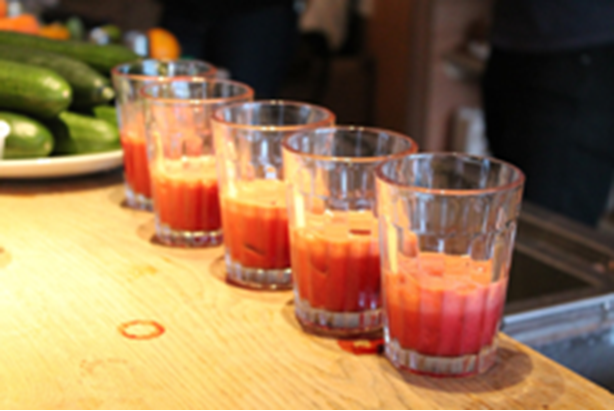 I took part in an Intro juicing event with Curry’s promoting a healthy lifestyle, on 1st February, at the beautiful Lambert’s Yard – organised by Joe Bloggs Bloggs. This was my kind of event, mainly focused around the benefits of juicing, as I love promoting good nutritional advice and lifestyle tips for super health and wellbeing. It was really exciting to be part of the whole thing. There were 54 bloggers at the event – with their impressive BIG cameras! The bloggers were divided into 5 groups rotating each station. Amongst my nutrition station there were four other interesting stations – Yoga with the lovely Amanda from Yoga Elementz, Gourmet Soup, delicious Mocktails with Nick, and a ‘Playstation’ – not the kind my kids wish for – this was where you created your own vegetable and seriously fruity concoctions! At my nutrishan station, I shared the knowledge of juicing for health benefits and conjured up a handful of balanced juices (80% veg / 20% fruit). I was brave enough to offer one of the groups a serious green juice which to my surprise went down a treat…ok after I added a little pineapple to it! I hoped by the end of the day that I had swayed the bloggers towards supercharging their health through juicing, and with a little superfood supplementing along the way. Below I’d like to share a collection of some of the recipes for nourishing juices I put together on the day. It’s a convenient way of getting vital goodness in a glass and a great habit to introduce into your busy lifestyles. Just remember to keep the fructose content low and as a rule of thumb stick to 80% vegetables and 20% fruit ! Radiance skin juice – my favourite!